U.S. Municipal Solid Waste Management Market size was valued over USD 17 billion in 2017 and is predicted to grow over 4% by 2024. 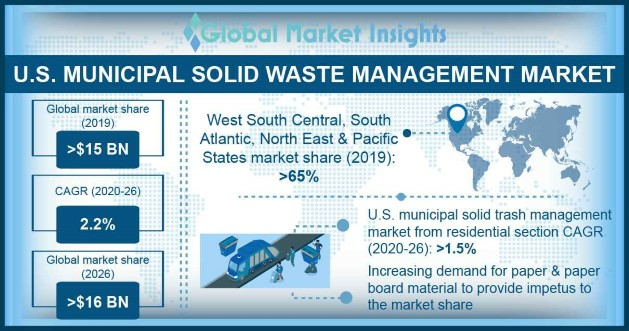 Ongoing government measures aimed to develop cost effective and sustainable trash management practices will drive the U.S. municipal solid waste management market. The regulators have framed zero-waste program that strive to execute comprehensive, and innovative recycling initiatives with an aim to enhance WTE efforts. Furthermore, introduction of incentive measures to attract private participation across the country’s recycling industry will positively impact the business outlook. Positive economic outlook accompanied by significant surge in the GDP will augment the municipal solid waste management market size. As of 2017, U.S. annual GDP has expanded over USD 19,485,400 million which is 2.2% higher than that of previous years. Key factors including rising construction & household spending have flourished the country’s GDP leading to better fundamentals for the MSW industry. Paper & paperboard trash accounted for over 26% of the U.S. MSW management market share. Flourishing packaging industry coupled with rising application for recycled paper will tend to drive industry growth. Plastic waste is anticipated to witness substantial growth of over 4% by 2024. Surging applications across household end consumers will augment the municipal solid waste management market. In addition, increasing demand for low cost durable items will uplift its end consumption which in turn will raise its recycling business. Steep progression in the population owing to rising concentration of foreign nationals will positively impact the U.S. residential MSW management market. As of 2016, more than 40 million residing in the U.S. were born in another country making up 13.5% of the nation’s total population when compared with 7.9% in 1990. Proliferating country’s economy with the growing service sector industry will drive the commercial municipal solid waste management market. Ongoing investments across education, healthcare, and hospitality sector to cater the rising consumer demand will positively influence the business outlook. Recycling & composting municipal solid waste management market was valued over USD 6 billion in 2017. The integration of consequent waste disposal and reprocessing technologies to convert trash into reusable material will accelerate industry growth over the forecast timeframe. Incineration and combustion MSW management market is anticipated to witness substantial growth on account rising WTE application for electricity generation. As of 2015, 0.4% of the total U.S. electricity generation coming from various WTE facilities. Over the coming years significant investments is being anticipated towards the development of more innovative and sustainable solution for trash incineration which in turn will favor the industry landscape. North east region on account of its high commercial bases and large urban population is anticipated to witness significant growth of over 6% by 2024. As of 2017, more than 85% of the region’s population were residing in the urban area which is accelerating the industry revenue substantially. Florida MSW management market is anticipated to witness substantial gain of over 5% by 2024. Flourishing tourism industry will act as prominent factor influencing the overall industry growth. In addition, spurring commercial infrastructure investments from various private participants will uplift the industry size. 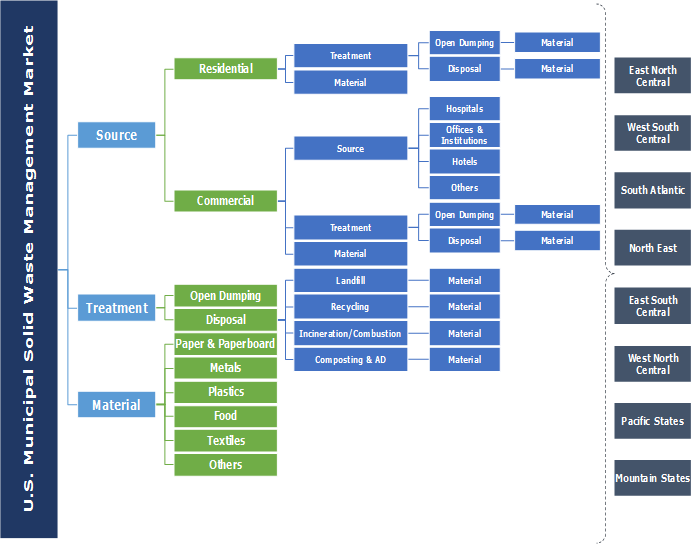 Notable industry players operating across the U.S. municipal solid waste management market includes Green Conversion Systems, John Wood, Xcel Energy, Recology, Hitachi Zosen Corporation, Covanta Holding Corporation, Wheelabrator, Veolia, Clean Harbors, Stericycle, Sims Metal Management, E.L. Harvey & Sons, Waste Connections, Suez Environment, The Hoskinson Group, Hi Temp Technology, SR20 Holdings and The CP group. The industry is witnessing steep progression with growing participation of global and regional. Favorable government initiatives including tax credit and other incentive measures will act as major driving factor influencing industry growth across the region. The Municipal solid waste (MSW), also known as trash is a category of waste comprising of everyday matters that are rejected by the residential and commercial end consumer. Over the past decade rising population has considerably raise the concentration of MSW across U.S. This in turn has raised the demand for innovative, sustainable and cost-effective approaches of waste management in the country.